We have been “catching up” on photos from Desolation Sound in 2007. You might miss the new galleries, as the posts are in chronological order, under the category “2007 Cruises”. The direct links are Family Lakeside Walk on Quadra Island and Family Cruise in Desolation Sound. Enjoy! 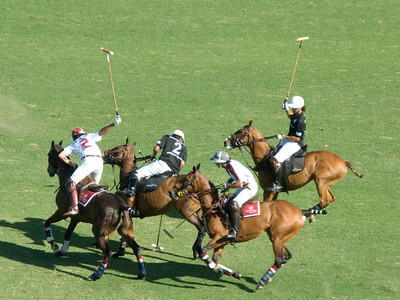 On Sunday 25 November we attended two polo games, the HSBC Cup and the Chandon Cup, at the Palermo polo grounds. We were so lucky to get back to Buenos Aires just in the nick of time to see the culmination of the Argentine season by the Campeonato Argentino Abierto Movistar. We have never before paid $100 per seat for a sporting event — this one was worth at least that. And not least for the opportunity to see a cross section of fashionable Portenos at play. Take a peek at the following photos of what we can only describe as “the dancing horses”. Do you agree? Before the Weindorfs left for home, we took advantage of having their car on Quadra Island, where ADAGIO was berthed at Taku Resort. We drove to an inland lake, and hiked the trails around the lake. David and Sarah enjoyed being mountain goats on the rocks. We found a tree that had been gnawed through by a beaver, and a bright orange cray fish in the clear water of the lake. The Weindorf family drove from Bainbridge Island to Campbell River, then took the ferry to Quadra Island. We met them with ADAGIO at Taku Resort, and we all sailed east to Desolation Sound for a ten day cruise. Our first anchorage was Squirrel Cove. We ordered fresh baked goods at the floating bakery. Having calculated the tides and currents accurately, Kim, Dorothy, David and Sarah took the yellow ClearBlueHawaii kayak into the lagoon on a rising tide. We visited all of the islands in the lagoon, and then caught the ebbing tide to take us out of the lagoon. The deserted islands were wonderful to explore on foot and along the shores by kayak. We walked on every island, examining the flora and fauna as well as the geologic formations. The water was very clear, and cold. The rocks had been polished smooth by glaciers. The trees gripped the rocks with their roots and grew gnarled and short. We berthed for a few hours at the Squirrel Cove dock, and lunched at the outdoor cafe. Dorothy purchased more floating line for the prawn trap. Alan had bought a prawn trap in Port Angeles. The first time we set the trap, we retrieved nine Pacific prawns, two red rock crabs and five squat lobsters. The prawns were delicious as a before-dinner cocktail. We re-fueled in Refuge Cove, enjoyed pizza and bergers at the cafe, visited the quaint store, then made our way to Prideaux Haven, one of the world’s most beautiful anchorages. The Weindorf family piled into the yellow kayak and paddled to one of the warm coves for a swim. Alan, Sarah and Dorothy paddled the kayak to the head of the trail to Melanie Cove. We bushwhacked our way through the dry rainforest, not sure we had actually found the trail. The views of the water were very pretty, and the forest was pristine. We took ALLEGRO for a tour of the cove. David and Dorothy proved that ALLEGRO could be propelled with paddles, all the way out to the entrance of the cove and back to ADAGIO. The second time we set our trap, we brought up 30 prawns. This haul was made off of the entrance to Prideaux Haven. We made it through the entrance to The Gorge, where First Nations’ petroglyphs are said to be on the cliff face. The berth at The Gorge Marina allowed Sarah to find dozens of tiny sea stars. We set her fish trap, but it came up empty. We had been looking forward to returning to Mansons Landing. David and Dorothy paddled the kayak from ADAGIO, into the saltwater lagoon, on a rising tide which carried us across the lagoon to the waterfall which empties out of Hague Lake. We were careful to avoid the quicksand which had trapped Kim the year before. Steve, Alan, Kim and Sarah took ALLEGRO to the dock, then walked to Hague Lake. David and Dorothy saw thousands of tiny crabs, live sand dollars and oysters as the tidal current carried us in water about ten inches deep. We portaged the kayak up the bank of the lagoon, through the forest, and down the hill to Hague Lake. We all walked, swam and paddled the kayak in the lake until late afternoon. Everyone walked back to ADAGIO, while David and Dorothy portaged the kayak once again, and took advantage of an outgoing tide to carry us back across the lagoon, and out into the harbor where ADAGIO was anchored. We returned to Taku Resort in Drew Harbour, and watched some locals unload hundreds of prawns from their trap. They told us to set our trap in 100 meters of water on the other side of Rebecca Spit. In the morning we had caught prawns! Three orcas swam into the harbor, and past ADAGIO — a female, a baby, and a male. We were told that orcas swim past the harbor from time to time, but rarely swim into the harbor like that.